If it was a manufactured compound in pill form, it would be high-priced and called a wonder-drug. Eating it helps to protect against breast cancer, leukemia, colon cancer, prostate and liver cancers, and also lung and bladder cancers. It has cardiovascular benefits, lowers the risk of cataracts, helps maintain strong bones and helps to prevent certain birth defects such as spina bifida.This super food, which originated in Italy and evolved from wild cabbage, is broccoli! When I was growing up...broccoli was always served cooked...sometimes too long and then, this mighty vegetable would become limp and yellowish. Most of us can tell when broccoli is being cooked...the the sulfur compounds within the plant break down and permeate the air...and it stinks! Someone, however, came up with the bright idea that finger food and all sorts of dips and cut up vegetables should be featured in women's magazines. Everyone who wanted to be considered modern loaded their buffet tables with colorful plates of raw food. The first time I saw raw broccoli served as an appetizer with dip, I thought it was a joke...but, I tried it anyway. 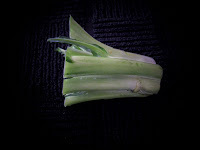 I doubt anyone at that time, knew how great this vegetable served in its raw form was for the human body. I have learned to love broccoli in spite of its stinky presence. It is such a versatile plant...it can be eaten raw or steamed, buttered or drizzled with lemon, in a casserole or an omelet with cheese or without, as a side dish or the main event...the recipes are endless. A word of caution, however, to get the most food value and to preserve the antioxidants in broccoli...less is more. Microwaving is a big NO...it will zap away almost 100% of the three major cancer-fighting properties...steaming takes away almost none of them. If a recipe calls for the broccoli to be sauteed or steamed, it should be done for no longer than five minutes. Another interesting fact is that many of the cancer-fighting compounds form after the broccoli has been cut up...and it should sit after being chopped or cut for five minutes prior to cooking. Just 3-5 (one cup) servings of broccoli, cabbage or cauliflower per week have been shown to be sufficient protection...and, on one final note, cooked tomatoes with broccoli increase the benefits significantly. 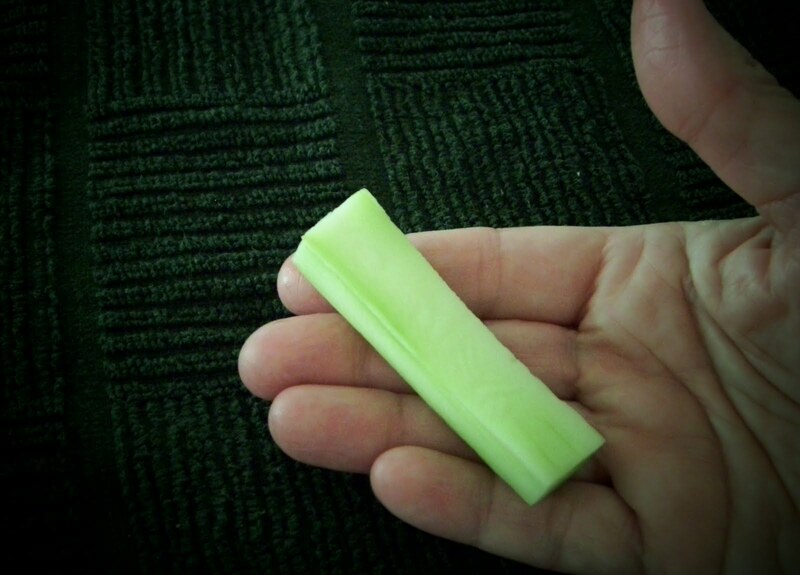 My dad did not spend much time in the kitchen, but I do remember something he showed all of us...he took a broccoli stem and cut away the tough outer skin, leaving the tender inner core. We would salt and pepper these tasty, crisp (raw)snacks. Today's recipe(s) use raw broccoli disguised as a salad. The flavors blend together in wonderful harmony and the crunchy textures of everything in the salads makes every bite interesting and satisfying. 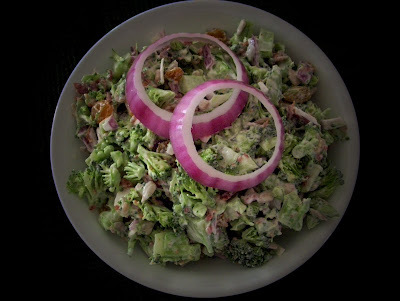 My son-in-law introduced the broccoli salad recipe to our family and we all count it as a favorite. The second recipe was generously shared after someone's mother brought the salad to a grade school luncheon when my kids were little. It is also wonderful. Chop broccoli, including stems. Add mayonnaise to make a nice blend. Add sugar by teaspoonful to make mixture barely sweet. Stir in a layer of seeds and a few raisins. Add real bacon bits and a T of chopped red onion (more if desired). Stir well and refrigerate. (I cut the recipe in half for just 2 people to enjoy). Mix all the ingredients well, but gently. Refrigerate. Serve. I have brought this salad to work on several occasions and it was a big hit. When made correctly, it is an excellent fusion of flavors. This is a great salad...and Tony is right when made correctly. Once I chopped up and added way too much red onion. I then spent over an hour picking out red onion. It ended up being okay, but since I am very careful about the amount of red onion used!!! Marian wrote: When I saw the blog about broccoli, I felt very virtuous, as I had eaten broccoli for dinner last night and tonight. It had been steamed, but I'm also very fond of raw broccoli. I have a recipe for the salad similar to yours. 32. Back Burner Beans - Is it a Fruit? 31. Sloppy Joe - What's in a Name?